SORRY NO AVAILABILITY UNTIL 7TH SEPTEMBER. MINIMUM STAY 3 NIGHTS. Flexible and friendly B&B with discounts for longer stays, allowing visitors to use their room during the day, and have breakfast as late as they like. Access to garden and shore. One double bedroom with superb view, and one twin / single bedroom. SORRY NO AVAILABILITY UNTIL 7TH SEPTEMBER. MINIMUM STAY 3 NIGHTS. Ideal for a full holiday as we offer progressively lower rates the longer the stay. (Because of our system of discounts for longer stays, off-season and single occupancy discounts, we are unable to provide a a meaningful guide price here. We suggest you visit our website for more information on prices.) We also provide a clothes washing and drying service. Breakfast times are completely flexible enabling guests to have a long lie in if they wish. Also guests can use their room and garden during the day. We have extensive local knowledge, both the immediate locality of Avernish and Nostie, and the wider area. We can provide annotated maps of beautiful local walks. We also know the Isle of Skye very well. 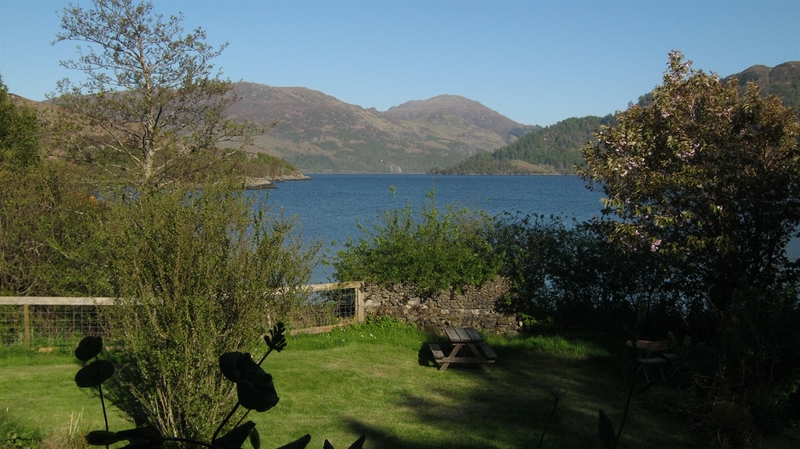 Our B&B has a beautiful location on the shore of Loch Alsh, looking towards Loch Duich. The garden is large and there are places to sit and enjoy the scenery. We provide a delicious buffet breakfast using, as far as possible, a very wide range of healthy, wholefood, fresh, organic, free range, locally sourced and Fair Trade produce, as well as the popular favourites. A room-only option is negotiable for those on a tight budget. Please bear in mind that we are friendly and informal, rather than "posh" or "stylish". We provide comfortable accommodation, but we would not describe ourselves as "luxury". The interior and exterior have mixed styles.